VietNamNet Bridge - High-quality, made-in-Vietnam products are also becoming better known to consumers. Yoshimoto, a button mushroom produced in Bao Loc City in Lam Dong province, has been selling well since it appeared in large supermarkets in HCMC, Da Nang and Hanoi months ago, despite high prices of VND200,000-350,000 per kilogram. In recent years, pricey mushrooms such as King oyster, winter and button mushrooms are the choice of middle-class families. Having realized the high demand, investors have begun growing mushrooms in Vietnam. Yoshimoto Mushroom set up a mushroom farm in Bao Loc City in late 2016 with capital of $3 million. It harvests one crop with output of three tons every 40 days. 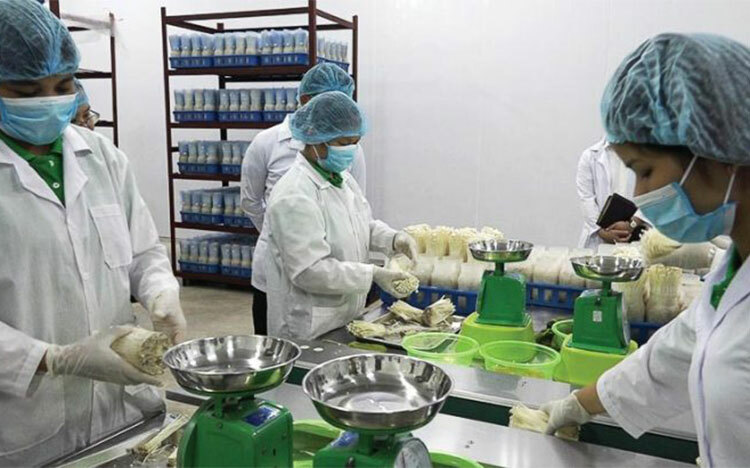 As for Duong Thu Hue, thanks to 10 years of working as an interpreter in Japanese and a mushroom producer at the same time, she has gathered experience and established relations to build a winter mushroom factory Kinoko Thanh Cao in Hanoi. Hue said velvet mushroom production requires huge investment capital as it needs large workshops and material volumes. This is considered a risky job, so investors remain reluctant to invest in the field. About 90 percent of velvet mushrooms available in Vietnam are imported from China, South Korea and Japan. It took Hue three years to persuade the Japanese partner to transfer the farming technology to her. About 90 percent of velvet mushrooms available in Vietnam are imported from China, South Korea and Japan. The Japanese partner wants the Vietnamese business owner to have at least 10 years of experience in growing mushrooms, and knowledge about the market and rivals. After many years working in South Korea, three brothers, Phung Duc Dinh, Phung Duc Cuong and Phung Van Cuong, returned to Vietnam in late 2017 to set up Nam Phung Gia Company, producing King oyster mushrooms in Vinh Phuc. All the equipment used at their factory is made in South Korea or designed in accordance with South Korean models, while the production steps all satisfy Vietnamese VietGAP standards. Nam Phung Gia, after investing VND20 billion in the farm, now can harvest 400 kilograms of mushroom a day, or 10-12 tons a month. The products are selling well in the north at prices of VND120,000-150,000 per kilogram. Though the high-end mushroom market in Vietnam is promising, it is a risky investment. Tang Thanh Duc, owner of a mushroom farm in Lam Dong province, believes there are many investors who have enough money to implement mushroom farming projects, but they either still lack passion or have technical problems. Meanwhile, households with limited resources cannot join forces to form complexes to develop large-scale production projects.